I’ve been obsessed with gardening since I was a child When I decided I wasn’t passionate enough about art to stay an illustration major I dropped out of college and started expressing myself artistically through garden design. I also became an avid and somewhat obsessive plant collector. I trained as a horticulturist at The New York Botanical Garden School of Professional Horticulture. I also worked there as an intern in the demonstration gardens and plant records, a volunteer, and briefly as a glasshouse gardener. I also interned at the Mendocino Coast Botanical Garden in northern California and the Royal Botanical Garden, Kew in England fulfilling a five-year plan to train in New York, California, and England. I loved the Mediterranean climate and broad plant palette available in California so I moved here in 2006. 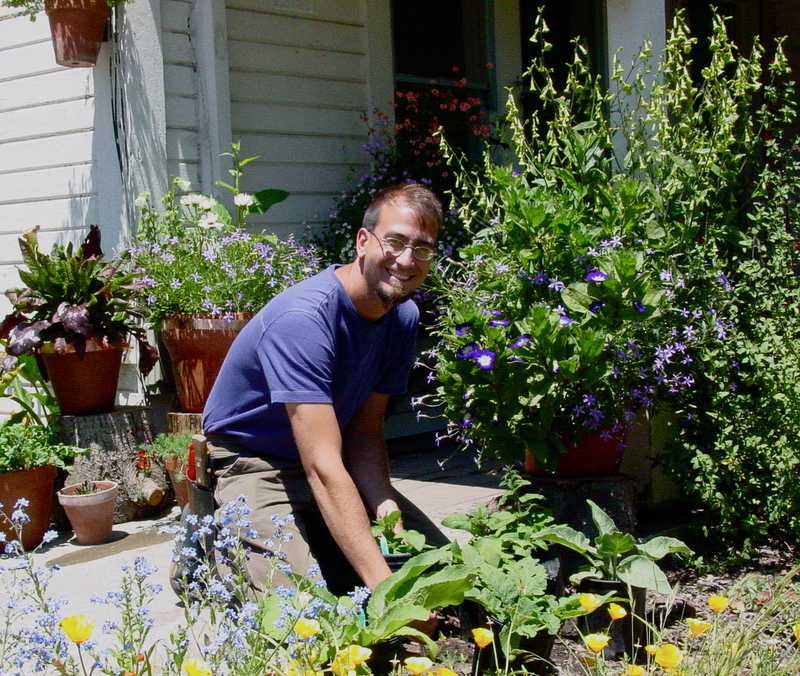 I am currently a garden designer living in Los Osos, California on the Central Coast. Great work. The place in SLO is really nice. The Bocce ball court is great too. You run an amazing blog. I am enjoying it thoroughly. Subscribed! Very kool blog. Your point on being inspired with gardening as a child is exactly my story. In fact i wrote quite a lengthy childhood memories piec on that a month ago on my blog. I hated sports growing up in the 1960s and unlike other kids was obsessed with all things Nature. It’s stayed with me to this day. All memories related to plant and nature experiences are crytal clear and vivid in my mind. Stuck over here now in Sweden and a prisoner of the indoors so to speak has finally encouraged me to write my experiences down by way of three blogs. BTW, Robert Rutherford over at Cal-Poly there was my Ag Instructor growing up in San Diego co.
Look forward to reading after I bookmark you manually. I’m working on adding to an already existing native garden in Southern California. We’re about 30 miles from the coast in Whittier CA. I was wondering do you have any advice about plants to pair with Sycamores? Our plan is to add native coastal sage scrub to the already existing piece of land, but we want to have Sycamores to provide shade and leaves for compost. Do you have any advice? Please let me know. Also the soil we are working with is Clay and poorly drained. Did you see my post on the design I did for a garden at Varian Ranch? If you do a search with the words “Varian Ranch” in the search field above it should come up. We used Ribes sanguineum, Ribes speciosum, different cultivars of Salvia clevelandii, Salvia spathaceae, different cultivars of Arctostaphylos (some low ground covers and some large specimen plants), Muhlenbergias, Verbena lilacina, Ceanothus, and Aquilegia formosa. The garden already had two large existing sycamores. Their leaves are definitely large and quite messy so keep that in mind when placing them on your property. They are really beautiful when mature though. I would suggest adding compost to help with the drainage on your clay soil. I’m sorry to judge your little floating fellows so harshly): I suppose it does inspire a person to send their own ‘ likeness’ to you, yeah(:…. Yo Kaveh! My name is Max I met you at one of the garden by gabriel parties a few years ago at Cayocus beach. I was an intern working for Gabe at the time. I’m working up in Sac now and was researching plants when I found a photo of a Yucca bright star. The background looked suspiciously familiar and lo and behold it was a Gabe design. Small world! Anyways great blog, I’m borrowing your photos, they have a great quality (hope you dont mind its just for personal use). Hope your enjoying the Central Coast! Hey Max. Feel free to use my pics. Hope you are well! My name is Radovan, and I live in Milwaukee, WI. I found your blog this evening via Far Out Flora, which I had subscribed to a year or more ago. Anyway, your photos and horticultural expertise are outstanding! I’m particularly attracted to all the succulents, and like that you’ve taken so many of the photos close up; or at least without many man-made structures around. The plants look so much more impressive without a house or street in the background…, unless your showing the different phases of your garden or client’s gardens that you’ve designed. We bought a home in Temecula and I would like to start planning on adding many different succulents or other plants that may grow there. I guess it’s “high desert”, so I’m not sure how many of your flowers would grow there. But, we just installed new drip irrigation lines so that may help. By the way, I’ve taken the liberty to copy many of your images into my screensaver folder so that I can see them again! PS, Thanks for mentioning Annie’s Annuals website. I’ve bookmarked them as well! Hey I recommend getting the Sunset Gardening book. It divides up California and the west coast into more detailed growing zones than the normal USDA maps. Temecula looks like it is Sunset Zone 18 so it is still a mediterranean climate but you have less of the ocean influence as a buffer so your winters will be a little colder and your summers hotter. Most of the Agave and Sedums will be perfectly hardy and there are a lot of other desert succulents that will be fine. Aloes and Echeverias and some more frost tender varieties would be on a case by case basis. You might lose some or have some damage on nights that get below freezing but some may work perfectly well. Lots of plants that will work for you because it is still a pretty milde SoCal climate. Glad you enjoy the blog! Hey, I ran across your blog while doing Google research. I just started as a student in the SOPH program at the NYBG back in January. Send me an e-mail. I’d love to chat and pick your brain! Anyway, I am a plant collector too, But definitely working on a budget now. One thing that was a booster for me in this location was that my landlady is a past president of the local chapter of the California Native Plant Society. She planted the perimeter of the lot with various native trees and now large shrubs. Would love to meet you some time and compare collections. Maybe swap a few things. Spring is super busy of course, as I also try to grow a lot of organic food. But I spend all my spare time propagating stuff. Also, your photos are really great! Hey there! Great to see another Los Osos resident! I really love it here but I know what you mean about it becoming the next Cayucos. I am hoping that I can afford to stay here permanently but prices have already gone up so much. Has the sewer work started on your street yet? Some work was done on 7th right near me just last month and it seemed like a nightmare but I think they have moved on to Nipomo now. We should definitely meet up some time. Sounds like you live quite near me. They were doing very serious sewer work just over this little hill, a block away. It was a main line, I was told, and it went in very deep. I was told that they won’t come to my block for the line and the lateral stubbs until October. Which means I’ll be planting poppies in that area in the next several days. Your story is kinda “to-die-for” with an internship (or whatever it was) at Kew. I am an Anglophile (and a poppy-phile), especially when it comes to “the cottage garden.” Also, there was one photo on your blog showing your garden designs (on paper that is). I am wondering what software you use, if any, to do your plans. Hey there. I edited out the address and phone number as I didn’t think they should be posted on an open area of the blog that anyone could see! But I am right around the corner from you down a block and to the west. Feel free to stop by any time. Even if I am not around the entire garden is visible from the street. The designs I have shown on my blog have been hand drawn but now I use Vectorworks which is an AutoCAD program. Thanks for taking the address and phone out of the comment. I wasn’t thinking. I cruised a few blocks day before yesterday, and I think I spotted your house/yard. There was a prominent Geranium maderense, which I seem to recall you mentioning in one of your posts. Incredible plant that is. I had a white one in a pot for a year and a half, then wondered why I had white (it still hadn’t bloomed), and then gave it to my neighbor across the street. I suppose she put it in back. I haven’t seen it since. I saw, what, Tidy Tips? and the red and yellow linaria, and now I’m not remembering what all. Your front yard surely does set you apart in the neighborhood. (I’ve got the right one, no?) It’s been a very strange Spring for me and the things I’ve wanted to grow. Since moving here, with this sand, my delightful discovery was how willingly so many plants’s seeds volunteer. For example, I moved in at Christmas, three years ago, and the yard, coming through the rainy season was covered with Linaria morrocana. Still is, but now I try to move them to genuine waste areas of the yard. So began my journey to see if I could have an all volunteer garden, permaculture style, especially with the many good reseeders that Annie makes available. Early Spring was fine in my garden, but now past. I’m taking stuff out and putting things in for (early) summer. Not all volunteer, I’m afraid. Last year I did a fall mulch, so at least weeds aren’t so profuse this year. But the rains, as you know, we’re disappointing, and my garden shows it. Last year I had wonderful blooms on Spring plants at least half way through the summer, Now, my Baby Blue Eyes and certain selections of Clarkia don’t seem to want to grow at all. I am fairly busy this week, and the first part of next, but would like to meet you in a couple of weeks! Hey there. You have the right yard. There is always something with gardens. I’ve been doing some hand watering since the rains stopped so that hasn’t been so bad but yesterday my neighbors dog ran through my garden and did all sorts of damage. I love your blog. Sometimes it’s all about the passion of the gardener, not just the plants. I met a woman recently who spoke so lovingly, and with such passion about her garden, that I couldn’t wait to see it. The picture she painted was so magical, like one of my favorite childhood books, “The Secret Garden.” Her garden turned out to be filled with weeds, and half dead plants, but she loved it and her enthusiasum was catching. It was her magical place, and I was so glad that she shared it with me. Your garden is beautiful, but sometimes it’s just your excitement and words that blow me away. I watched videos these past winter nights on youtube. ” A year at Kew”, acutally two seasons worth, was fabulous. Again, the passion, and sometimes the nerdiness of the Kew staff was so addicting. There are also a lot of Alan Titchmarsh shows that are fabulous, as well as “A Year in A Cottage Garden” with Carol Klein. Why don’t we have garden shows like the BBC shows to keep us warm on cold winter nights? Ooh I didn’t realize that “A Year at Kew” was on Youtube. I’ll have to check it out. They had filmed the first season of that the year before I was at Kew and they were so happy with it (before it even aired) that they stayed for another year and were filming when I was there. We had a summer party and they showed us either part of the first episode or it might have been clips. I can’t remember. But I agree that the Kew staff was really endearing. It was actually a super fun place to intern. My favorite gardening series was one that Penelope Hobhouse did back in the 90’s. Sadly the US doesn’t really do any sort of gardening shows. Not enough money in it I guess. do you give tours of your garden, and/or tours of the gardens you’ve designed since moving to the central coast? Hi. That book is one of my favorites and in fact if you look back at the old posts of my blog you will see I planned a trip of garden tours to England a few years ago and the main reason was to visit her garden specifically! I loved it even more in person than I thought I would. I don’t think my garden is actually very tour worthy. It is fairly small and quite new. I’ll probably be moving in the next year or so and hopefully I’ll have a tour worthy garden at my next home. That is my plan any way. Most of my garden designs are fairly new as well but if any of the home owners ever include their gardens on one of the local garden club tours I will be sure to publicize it here. Penelope Hobhouse was fanatstic. Some of her shows are on youtube, also. And, the series Alan Titchmarsh does on famous gardens, why they were designed as they were, and how they influence gardening today is also fabulous.